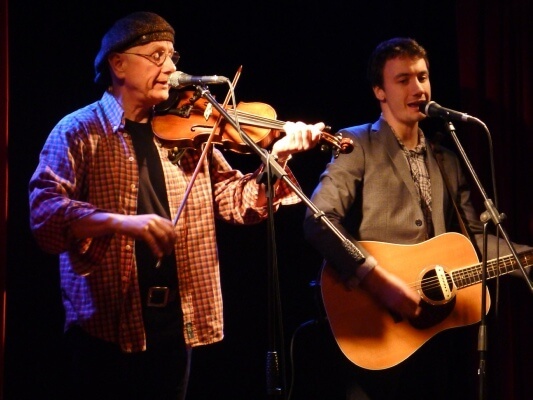 Leading folk musician Tom McConville comes home! On Thursday 28 April leading folk musician Tom McConville is playing a very special gig, in the pub where he lived and first played in public over 60 years ago. Tom was born and brought up in Tyneside and for many years lived at The Globe. Indeed his latest album Back to Scotswood recalls his formative years in the family pub. He’s one of the foremost fiddle players of our time. A virtuoso musician and fantastic singer, his rich and warm voice makes his interpretation of traditional and contemporary songs greatly admired by singers throughout the world. In great demand as a performer, session musician and teacher; playing the fiddle is his lifelong passion and he has achieved every player’s dream of creating his own unique, instantly recognizable sound. His live performances combine a rollercoaster of musical delights from fast, rhythmic dance tunes , through beautiful slow airs and of course, great singing. All presented with his inimitable sense of humour and style. David Newey often plays with Tom McConville. David’s guitar style is unique and unrivalled, encompassing both the flatpick and fingerstyle techniques with power, fluency and control. David often blurs the boundaries between acoustic and electric styles, coaxing out sounds normally associated with rock and roll, jazz and country, and placing them within his more folk based playing.